A new study shows that the black leopards of the Malaysian Peninsula actually sport hidden spots that reveal themselves under infrared light. Infrared photos of the distinctive spotting pattern on the big cats' coats allowed researchers to identify 94 percent of the leopards. A leopard really can't change its spots - it can only conceal them. 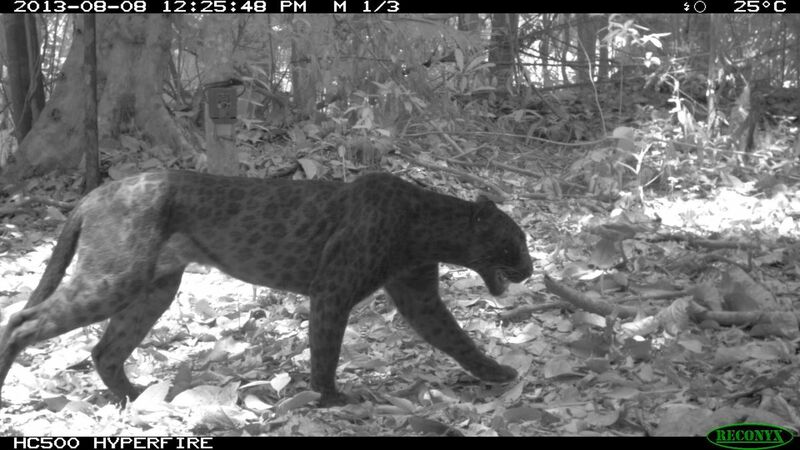 The black leopards of the Malaysian Peninsula may look like they have uniform dark coats, but hidden cameras with infrared light have revealed a surprise: The black cats sport the characteristic leopard spots within their dark-hued coats. The new insight has allowed conservationists to reliably identify individual animals based on camera traps, the first step in preventing widespread poaching, according to new research. Leopards are the most widely dispersed wild cat in the world, showing up everywhere from sub-Saharan Africa to the Russian Far East. Most have a distinctive and immediately recognizable spotting pattern, and for decades, the ubiquitous "leopard print" has shown up on bathing suits, fur coats and countless tacky 1970s-era bedspreads. But a 2010 study in the Journal of Zoology study found that almost all Malay leopards have the gene for melanism, or black coats. Scientists don't know exactly why, though some suspect the black cats evolved their shadowy coats to better camouflage themselves while hunting in the dense jungles of the island nation. "This black coat may have made them 'perfect stalkers' in our dimly lit Malaysian jungle and this advantage may have helped them compete with tigers for similar-sized prey," said study co-author Gopalasamy Reuben Clements, the co-founder of the Malaysian jungle conservation organization Rimba. Alternatively, the Malay leopards may be black through random chance. Some have even hypothesized that the Mount Toba super-eruption about 74,000 years ago wiped out all but a few of the leopards, and those leopards that survived happened to be black, Hedges told Mongabay.com. Either way, the vast majority of Malay Peninsula leopards sport dark coats, which has made counting the leopards, and in turn conserving them, surprisingly tricky. Despite a cornucopia of prey species for the big cats, few have been spotted on the peninsula. "Many dead leopards bearing injuries inflicted by wire snares have been discovered in Malaysia," study co-author William Laurance, a biologist from James Cook University in Australia, said in the statement. In addition, leopard skins and body parts have been found in trading markets at the border between Myanmar and China, he added. Those facts suggest the leopard population is threatened by illegal poaching. The first step in protecting leopards is to figure out just how many there are. Conservationists often track individuals by deploying camera traps that automatically snap photos of the cats. But with their all-black coats, the big cats are tricky to distinguish in these candid shots. But in 2010, researchers poring over the camera trap footage fond a surprise: The cats in the night photos had spots. It turned out the near infrared flash that was activated in the night revealed a hidden spotting pattern underlying their coat. The strange effect is a result of the pigment, known as eumelanin, in the leopards' fur coats. The longer the wavelength of light hitting the pigment, the better it transmits the light, Clements said. "Because near infrared light from our camera traps has a longer wavelength than ordinary light, eumelanin in the less heavily pigmented background of the fur coat appears less opaque when illuminated by infrared camera traps," Clements told Live Science in an email. Normally, the infrared flash is only activated at night, but the team blocked the cameras' light sensors, tricking the camera into thinking it was always night and always flashing the infrared light. The result? Each leopard photo revealed the cats' distinctive underlying spot patterns. As a result, the team could individually identify 94 percent of the cats it photographed. This led to the first estimate of the population density of the Malay leopards, revealing about three leopards for every 38.6 square miles (100 square kilometers), according to the study, which was published online in the Journal of Wildlife Management. The new estimate is the first step in monitoring and conserving the leopard population, Clements said.